This morning on the Aurora we headed out towards the northwest corner of Stellwagen Bank. It was a beautiful day with very good visibility. We spotted a blow in the distance which looked to be a fin whale based on the shape of the blow. As we approached the animal it still appeared to be a fin whale however with the first look at the body is became apparent it wasn’t a fin whale. 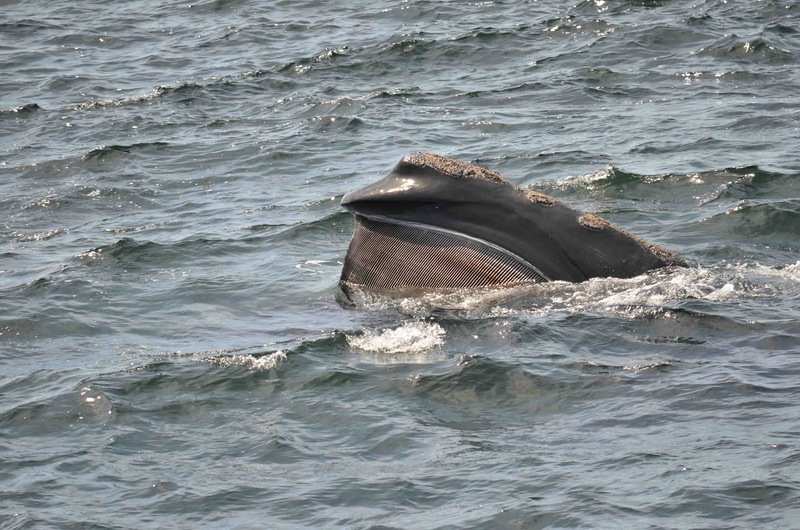 It was a skim feeding North Atlantic right whale which proceeded to circle the boat at close range! Between the intern and myself we managed to take over 250 photographs of the callosities on top of the animal’s head that can be used to identify individual animals which will be sent to researchers at the Aquarium. Seeing a right whale at any distance is a treat however seeing a feeding right whale at close range is a once in a lifetime experience. After the animal moved away and we were able to safely maneuver out of the area we continued our search north but didn’t spot anything else. It was a truly unforgettable day.